Review Hycosan Extra Eye Drops Good for lens wearing. Review Hycosan Extra Eye Drops Excellent for dry eyes. Review Hycosan Extra Eye Drops These suit my eyes and give relief from dry eyes. I wear my contacts for 12-14 hours a day and using these drops really helps. Review Hycosan Extra Eye Drops Lubricating drops that can be put in even when wearing lenses. Review Hycosan Extra Eye Drops High quality, long shelf life, very economical dispenser, delivering exactly the right amount. A bit pricey for me. Review Hycosan Extra Eye Drops This is great when my eyes are a little dry with my lenses in! Review Hycosan Extra Eye Drops I wear contact lenses for reading and my eyes tend to be quite dry. These drops are far superior to the normal 'comfort' drops you can buy elsewhere and I would recommend them without hesitation. Review Hycosan Extra Eye Drops I have blepharitis. These drops are excellent for lubricating eyes without affecting vision. Review Hycosan Extra Eye Drops I wear GP lenses and have dry eyes due to medication , these drops may seem more expensive than other brands but i do have to say they are worth it , they really lubricate the eye and make wearing contact lenses much more comfy. Highly recommend these i know ill be sticking with them. Hycosan Extra Eye Drops I've suffered from dry eyes for years and just couldn't find eye drops that kept my eyes feeling comfortable for more than just a few hours. Hycosan Extra keep them hydrated for longer. Hycosan Extra Eye Drops Hycosan eye drops are the best! Out of all of them I prefer the extra ones as they keep my eyes hydrated for much longer. A fantastic product This product does exactly what you expect from a great eye drop. 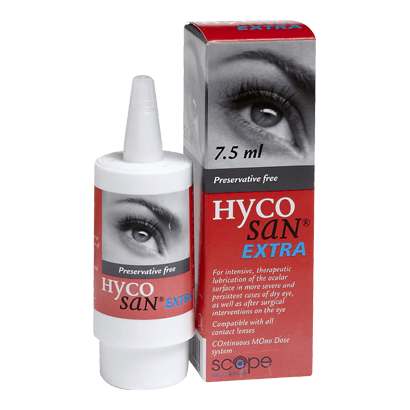 I suffer with dry eyes, especially at the end of the day and hycosan are brilliant. I would strongly recommend this product. Hycosan Extra are the best I scratched my eye badly last week and was recommended to use Hycosan Extra eye drops. They have been a life saver, the most effective eye drops I've ever used. Formulated to be more viscous than normal eye drops, Hycosan Extra Eye Drops are a powerful means of ensuring that eyes are moist so wearing lenses is as comfortable as possible. Formulated without the use of any preservatives, which means that irritation is far less likely for sensitive eyes, the Hycosan Extra Eye Drops are still extremely powerful. Scope Healthcare suggests administering the Hycosan Extra Eye Drops three times per day in each eye. Using the drops is made even easier by the firm's patented Comod delivery system, which ensures that each drop can be delivered at the click of a button in equal dosages. Each batch of the eye drops will last for five weeks with normal usage. After opening, Hycosan will still be effective up to a period of six months. If you need any advice about how to buy your contact lenses online, we're here to assist you 24 hours a day, 7 days a week via web chat, phone (020 7768 5000 - UK, 1 800 870 0741 - US) or email - help@visiondirect.co.uk. Have a question about ordering from Vision Direct? Check out our handy how-to guides.